I imagine this will see a lot of play in Standard after Azure Drake rotates out, unless we get a better 5-drop in Un'Goro. a 5 mana 10/10 that can be silenced to a 4/4. Sea Giant at most 4 mana 8/8 or even cheeper if the opponent has a board. Alternatly you could say that a 6/6 is optimal as it dodges Big Game Hunter , but if that is the goal you might as well run a Pit Fighter which is way more consistant as it is always a 5/6 for 5 mana. 5 attack is really good and having 6 instead doesnt really do that much concidering common targets as Sylvannas, Loatheb, Emperor Thaurissan and all the 3/5 minions with effect minions. 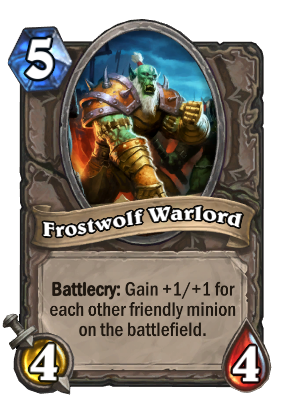 But Sea Giant costs 400 dust and this costs nothing, for F2P players this card is really good. Additionally, Sea Giant might not be able to get on the board as early as this card does. Not a bad choice in ARENA, especially when you're short of big minions during your current pick. Usually it comes out as a 6/6 for safety reasons, where you have 3 minions on board and can thus evade the threat from Big Game Hunter and Mind Control Tech. Otherwise you just build up this minion as large as you can, up to a possible 10/10 monstrosity.